Dyson vs Shark Vacuums – What is Best in 2019? 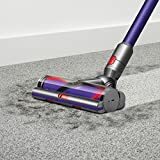 Dyson vs Shark vacuums – What is best in 2019? We look at the newest offers in both full size uprights and their Cordless Stick Vacuum models. We have looked at these two competing companies and the vacuums they produce for several years now. During that time we saw each of them win the JD Power Customer Satisfaction Award for various vacuum cleaner models. In 2018 We saw Shark win the customer satisfaction award for the upright vacuums and Dyson won the customer satisfaction award for the Stick vacuums. In both instances, the other brand was right behind with high satisfaction scores as well. Going forward Dyson plans to rely on current technology for their upright vacuums as they have announced that they will not be developing their upright vacuums any longer. Instead, they plan to develop their line of stick vacuums. Don’t worry if you really love the upright Dysons… They are still being manufactured. They just are not upgrading them. Shark, on the other hand, continues to innovate with new and better features each year. These features generally are things that make life easier for the one doing the vacuuming. Perhaps that is the reason that their customer satisfaction scores keep increasing. For instance, This model of the Shark Apex cleans hair off the brush roller as you vacuum. It also includes two brush rolls on one cleaner head. That means that you do not need to change heads when you go from hard floor to carpet. The Duoclean system also pulls in larger debris instead of just pushing it aside. If an upright is what you need, you might want to check this one out. Stick vacuums have become increasingly more popular due to the fact that they are lightweight and easy to handle. Big and bulky seems to be out and the trend is more lightweight, streamlined and efficient vacuum cleaners. Also, the batteries for the cordless vacuums seem to be getting more powerful thus enabling you to use a stick vacuum for a longer period of time. In the past, about all they could be used for is the quick pick up for maintaining your home. Would a more modern cordless stick vacuum work for you too or would the traditional vacuums above work best? Let us take a good look at the benefits of both Dyson and Shark’s Stick vacuums. Dyson has been producing stick vacuums for some time now. However, the battery life was so short that they would not be beneficial for cleaning the average home with kids or pets. They were more appropriate for quick cleanups. 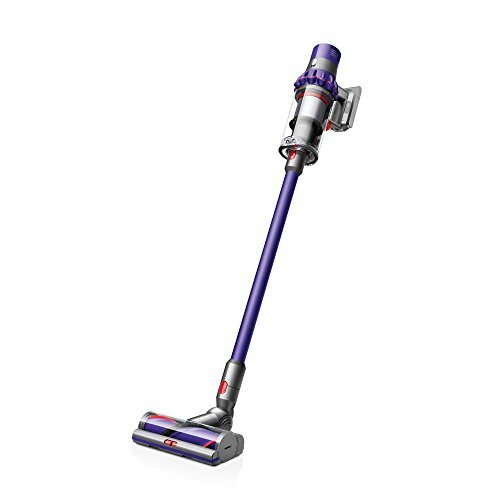 Their newest model of the cordless stick vacuum is the Dyson Cyclone V10 Animal Lightweight Cordless Stick Vacuum Cleaner. The V10 comes in 3 versions: The V10 motor head is the basic version and lower priced. The Animal comes with the torque drive motor head, more tools and is median priced. Then there is the Absolute which comes with both a soft roller-head for hard floors, the torque drive motorhead for carpets and even more tools. We feature the Animal in this article. Of course, Shark challenges the Dyson stick vacuums with models of their own. Shark’s current best stick vacuum is the Shark ION F80 Lightweight Cordless Stick Vacuum which includes MultiFlex technology as shown here on the right. The DuoClean system for both carpet and Hard floor, plus the hand Vacuum mode and two removable batteries makes the Shark product hard to beat. From our viewpoint, both Dyson and Shark have some impressive stick vacuums but there are some major differences which may sway you in one way or the other. The first point is of course… the price. Although the price varies from time to time, you can generally expect to pay considerably more for the Dyson than the Shark. Neither of these updated models comes cheap. But for many people though, the quality and benefits make them well worth it. up to 20 minutes in suction mode 2 with torque power head. For a little more depth of information we will show you some of the benefits and drawbacks of both vacuums… First, the Dyson V10 Animal. Dyson has 3 power modes for this model. The low power mode is recommended for lighter cleaning jobs like above the floor cleaning with the non power tools. Low power mode without a powered cleaning head is the mode where you can get up to 60 minutes out of one battery charge. Suction 2 used with the Torque cleaning head can give you up to 20 minutes of fade free power. When you come across an area that needs more power to remove the dust and dirt, that is when you use the Max power mode. The combination of these different power levels give many people all that they need. One thing that saves power on the Dyson V10 is the Instant-trigger Release. It automatically shuts off when you release the trigger. The drawback to that is that holding the trigger for an extended period of time can create pain from hand fatigue for some people. The ultra lightweight of the Dyson V10 makes for easy push and pull moves and comfortable turns with just a wrist twist. It is versatile as well with the ability to turn it into a hand vac or use the tools for all the above the floor cleaning. It is also great to clean out your car. The Versatility of the V10 is enhanced by the “Click-Fit” tools which come with the vac. The tools are securely locked into place until you remove them by pressing a button. As always, Dyson has a top notch Hepa level filtration in a completely sealed system. The filter can be rinsed clean with plain water. We like many things about the Dyson V10 but the long recharge time of 3.5 hours could be very inconvenient if you have a lot of cleaning to do. It only comes with one battery and an additional battery is not available at the time of this writing. If your home only needs lower power suction for most of the cleaning then this may work well for you. However, if your home requires maximum power for a lot of cleaning, you will be waiting on the vacuum to charge. The other drawback that we see for this vacuum is the price. For that amount of money we would want something that had full power for all of our time cleaning… Not just a few minutes here and there. 1 Power head and 2 Brush rolls that are designed for picking up fine dust and bigger size debris on carpet and hardwood/tile flooring. The softer brush roll in front also is great for buffing hardwood floors. 1 Eight-inch Crevice Cleaning Head Tool that is ideal to get to those hard-to-reach places. 1 Upholstery Tool which is great to get pet hair off your couch. 2 Lithium-Ion Batteries (40-minute run time each in ION Power Mode & a little less on high power). 1 Charging Dock with your new Shark. It would be nice if it also came with a flexible vacuum hose and the motorized pet tool but they can be purchased separately. It is easy to switch batteries for twice the Run time on this Shark. The battery is eject-able with just one click by pressing the lever on the bottom of the battery. The 2 Lithium-Ion batteries that come with this Shark are swappable and together can give you up to a total of 80 minutes of vacuuming time ((in ION Power Mode) depending on the surface type. You can plug the charger directly into the battery while it is still attached to the vacuum. In fact, Shark gives you 3 ways to charge the battery with or without the charger. We don’t like that the Charge time for each depleted battery is about 3 hours. This is less than the 3.5 hours for the Dyson though. Make sure you always have one battery on the charger. Also, with either the Shark or the Dyson… you cannot charge the battery while it is still hot. You need to wait until they cool off to begin charging. 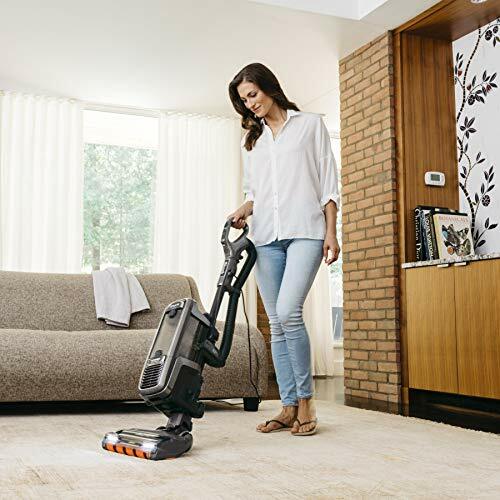 The Shark easily transforms to a Hand Vacuum… At the push of a button so you can take your cleaning above the floor for lightweight overhead tasks. You can Clean your car with this hand-held vacuum as well. The hand-held unit might be a bit heavy and bulky for some people using overhead at over 3 pounds. We love the Flexible Reach… Shark’s advanced MultiFLEX technology enables you to bend the wand to easily clean hard-to-reach places and under the furniture. For us it is not a big deal but it will not stand up on it’s own without folding over using the multiflex technology. But on the other hand, it is nice and compact for storage. 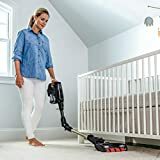 The Shark has Strong Suction Power with an improved and redesigned 300-Watt, 11.9 Amp, 120 volt Motor which provides powerful cordless suction for household dirt, debris, and pet hair throughout your home. The Shark IonFlex F281 weighs 8.7 pounds with the motor head and one battery. This is a little heavier than the Dyson but still considered very lightweight. 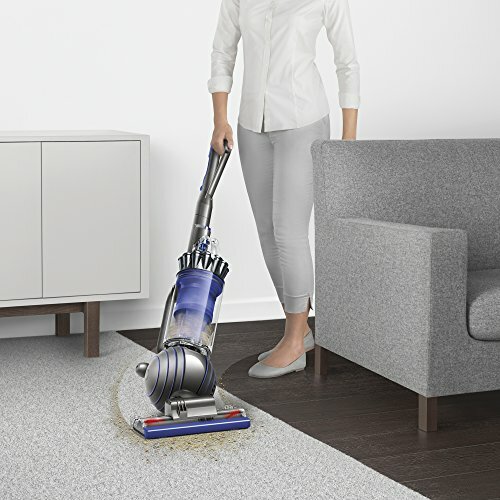 The “ION Boost” function basically puts the machine into a high-power mode for 60 seconds to provide much greater suction power for those trickier corners and bigger debris-covered areas. 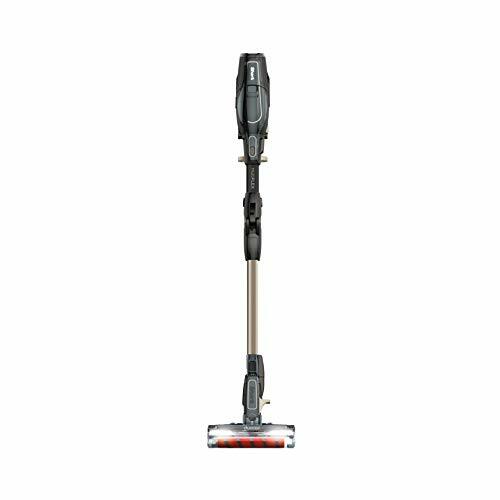 The Shark Stick Vac provides great versatility and is easy to maneuver around your home. Maintaining it is easy with the washable foam filters that can be accessed using two tabs. Shark recommends washing the filter once a month. We recommend purchasing additional filters so you always have one clean and dry. That link also provides a Hepa filter if preferred. There are always going to be people who prefer either the Dyson or the Shark simply because they are loyal fans of the brand. We believe that both companies have produced some awesome cordless stick vacuums here. If you are not ready to move forward to the stick vacuums then one of the mentioned full size vacs up above may be better for you. You have the right to disagree but for our purposes we prefer the Shark in both the full size and the stick vacuums. They are more versatile with more features that we personally like. They also appear to be a better value for your buck. We look forward to seeing what these companies produce in the coming year.